When we first saw the garden, it was just a large green empty space. There was one Ash Tree in the middle, which was potentially a bit of an obstacle to work around. The garden had a slope and a rocky ledge jutting out into it. All in all, we felt that it was a rather tricky area to work with. It represented the kind of challenge on which we thrive on at Gardenatics! We knew straight away that this garden needed a kids tree house transformation. The first thing we did was to listen to what the customer wanted for their garden. They envisaged a space for their two young girls to safely play outside. But wanted a large area where they could run around and burn off some of their energy. They were also keen on a sheltered space, where they could relax and store some of their outdoor toys. However, the main problem was not obstructing the view from the bedrooms with this potentially large wooden structure. Gardenatics came up with a premium designed multi-platform tree house that spanned the width of the entire garden. 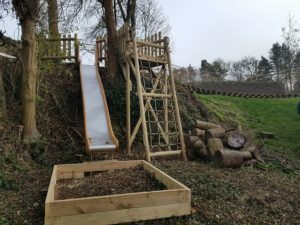 We used the natural slope to create inclines between the platforms, with the central platform sitting carefully around the Ash Tree. We were also keen to make the most out of the unused space around the rock outcrop. To this end, you can now find a large 8m long clatter bridge. Where a cargo net and stainless steel slide have been custom built to fit the rock outcrop. We felt that this would really challenge them and their abilities whilst having fun. One of the main features of this build was the big, ‘ranch’ style tree house. Underneath the platform, it had its own decking/patio and full access to the enclosed house, where the girls could sleep out and store all of their outdoor toys. The roof was carefully elevated so that the line of sight from the windows would pass straight through the apex. Fortunately leaving the views from the bedrooms untouched. We added additional, exciting elements for the two young girls. these included a fireman’s pole and a 7ft tube slide. There are also various different swings and lots of interchangeable parts that could be made more challenging as they get older. That’s what we’re all about! So to top it all off, we also added ladders, ramps and hand grips to make them more accessible but also enjoyable for the girls friends and other family members. After the project was complete, we asked the customer for some feedback. It was a delight to hear how please they were. They were very happy with the quality of the build and the professional nature of the installers. The girls now have access to a fun, challenging but also safe space. The garden is now a place where they could burn up their energy and make good memories with their friends. Now, the main problem is getting them back in for dinner every night! 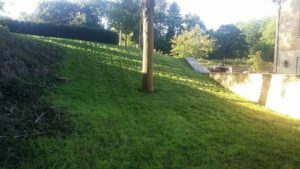 If you have a sloping garden, a tree in an awkward space, or simply want an activity centre for your children to enjoy, Gardenatics are here to help. Contact us today and find out how we could transform your garden and your children’s attitude to outdoor play.